It really is the beginning of the end. 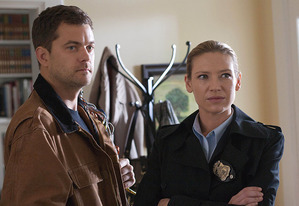 Three weeks shy of the fifth and final season premiere of Fringe, executive producer J.H. Wyman revealed on Twitter Thursday that the series finale will air Friday, Feb. 1. Fox declined to confirm the date of the finale, which will be written and directed by Wyman. In July, Fox boss Kevin Reilly told reporters the series' swan song would air in January. "There's probably going to be a few interruptions, but not many," he said at the network's Television Critics Association fall TV previews. "Just the holidays. [The series] will end in January." Only if January has 32 days. I swear if this ends even remotely similar to Lost I am going to scream and toss my Fringe DVD collection in the fireplace. Living in New England I will have a nice fire going in the fireplace in February when the series ends, just in case I have to make that toss. I personally do not even want to think about a date for the end of Fringe. I think the series had interrupted his the original script, with these last 13 episodes. Few as I was pleased, because he was drawing a cancellation of the series. Now I hope that happens a worthy end to the stories of Fringe, adequate and to the height of the original script, which foreshadowed wonderful, unique. Even as the words of a visionary convinced, I think Fringe does not end with these 13 episodes to come, I may be wrong, but ... the hope is the last to die. Happy anniversary, this day 4 years ago Fringe premiered, we had no idea what we were in for did we? If Fringe ends like Lost I will be extremely happy. However I fully expect Fringe to have a more balanced swansong so I'll likely end up being ecstatic! All dead in a church? Yeah, real nice ending.